With Spring Training right around the corner and only about a week from now, once or twice a week I’ll be posting a baseball article about one of the players I have autographs from. As many of you know, I am a die-hard Mets fan and one of my goals has always been to try to get the autographs of everyone who has every worn the Mets uniform. No easy task, for sure, and while I have many, there are still some I don’t have and likely never will. Guys like Rogers Hornsby, the Hall of Fame second baseman from early in the twentieth century, was the Mets batting coach in 1962 and died in 1963, making his autograph well out of my price range even for those that I have purchased over the years. Anyway, it has led me to get some autographs of players that many fans may not have heard of, but I often find those players more interesting and fun to get anyway. Such is the case of today’s subject, Hank Webb. Webb did not have a long career in the majors, spanning 6 seasons, but most of those he only appeared in a couple of games each year. He showed great promise in the minor league system of the Mets as was often talked about as a prized prospect. Unfortunately, he didn’t pan out and ended up getting traded to the Dodgers in 1977 for the great Rick Auerbach, who never actually played a game for the Mets. The only year he had significant innings was in 1975, when he started 15 games for the Mets. He was actually a part of two clubs that made it to the World Series, the 1973 Mets and the 1977 Dodgers, though he didn’t appear in the postseason and only pitched 2 games in 1973 for big club and 5 for the Dodgers. 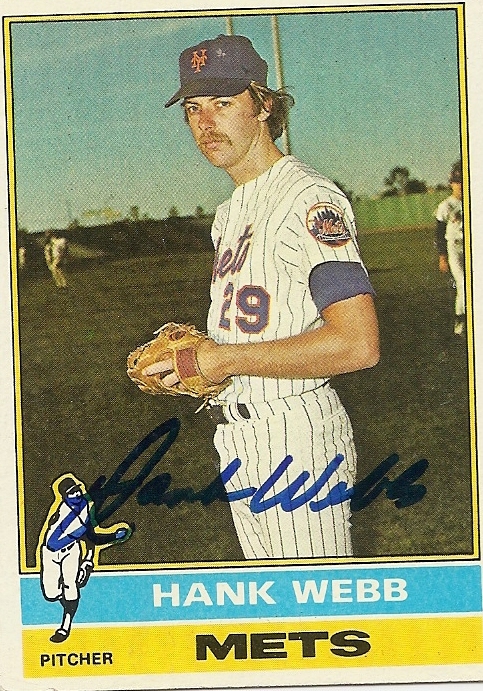 Some Mets fans may remember Webb mostly for being the losing pitcher in the 25 inning game against the Cardinals in 1974. Lesser known is that he did pitch a seven inning no-hitter for the Mets minor league team in Tidewater in 1974. Another interesting fact about him was that while he appeared in 29 games for the Mets in 1975, he also managed to hit .258, which is pretty darn good for a pitcher. The 1975 Mets team had a lot of potential with some good players mixed in with young talent, but things just didn’t come together that year. Sadly, we Mets fans are all too familiar with that mantra. Some people might also remember Hank Webb because he is the father of Ryan Webb, who pitched for the Marlins last year out of the bullpen. I don’t remember ever seeing Hank pitch myself, in person or on TV, but I was only 8 when he had his busiest season with the Mets. This is the only autograph I have from him, on a 1976 Topps card. You can add him to the list of Mets that might have been or obscure Mets no one seems to remember well. One thing I did notice when I was scanning this card is that he shares the same number as Ike Davis, my current favorite Met on the team. That’s my baseball memory for today. I’ll have another one later on in the week of another player. Anyone out there have any particular memory of Hank Webb? Please feel free to share it in the comments below. Enjoy the rest of your day as we creep another day closer to the start of spring training.